Conservas Palacio de Oriente , founded in 1873, is the oldest fish and shellfish cannery company currently operating in Spain with head offices in Vigo. 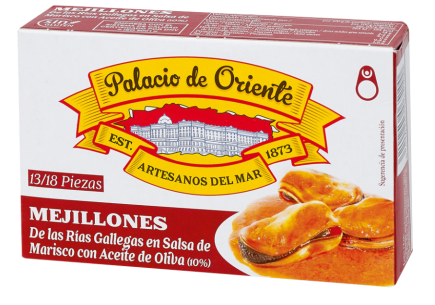 Palacio de Oriente canned foods are prestigious products that represent the perfect blend between modern technology and well-maintained tradition, which have kept the company among the market leaders for over 140 years. The range consists of a very wide variety of preparations that combine a variety of seafood and shellfish with the very best recipes and delicious sauces. The aim is to provide the highest guarantees of quality for every palate, from the most traditional to the most innovative. 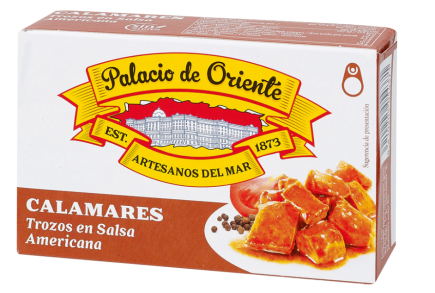 Palacio de Oriente offers a set of products with characteristics typically associated with the Mediterranean diet, which place a strong emphasis on the traditional values of canned food: healthy, natural, balanced, with no preservatives or food colorings and with the unmistakable flavor of olive oil. 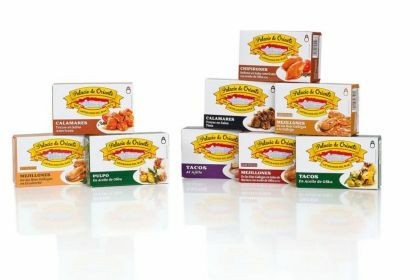 Palacio de Oriente's canned seafood products are notable for their high protein content and for the fact that they are rich in Omega 3 and Omega 6 fatty acids, particularly those preserved in olive oil.